It's that time of year. Did you read a newly published children's book this past year that you absolutely loved? From October 1-15, the public can nominate children's books high in both literary quality and kid appeal for a Cybils. Cybils is an acronym for Children's and YA Bloggers' Literary Awards. Books published published in English between Oct. 16, 2008 and Oct. 15th, 2009 are eligible for nomination. There's nine categories so that means nine chances to nominate the year's best books. Nominations close on October 15th, 2009 and everyone can participate. This is the fourth year for the awards. For what it's worth, I've always thought the awards should split the picture book category up into books suitable for toddlers/preschoolers and books suitable for preschool/early grade school. The picture book genre offers such a wide range of deserving books for various age groups, I think it is unfair to make them all compete together for the same award. Plus, it would make it a ton easier for parents looking for age appropriate books. In an attempt to bring attention to books for the very young, this year I nominated Higher! Higher! 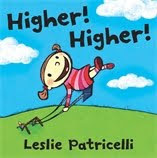 by author/illustrator Leslie Patricelli. It isn't an easy task finding books that both my toddler and preschooler want to read together. Higher! Higher! works perfectly for both age groups. In the book, a daddy pushes a little girl higher and higher on a swing. Boy does she ever go HIGH, way high in the sky and sees things beyond a child's wildest imagination. This book has made it into our before bedtime stack more times than I can count! Full of kid appeal, the illustrations are bright, creative and happy and the simple text makes it the perfect choice for younger children with a short attention span (they can chant along, saying "Higher! Higher!"). Another plus--my preschool daughter can easily "read" it to her 1-1/2 year old brother without my help. It's appropriate for both boys and girls. If my children had a choice, Higher! Higher! would win quite a few awards. Just out of curiosity, what are your favorite children's books published this past year? I liked Higher! Higher! too. I also enjoyed Miss Mingo and the First Day of School, totally cleverly done and very educational.